The new chairman of the state Board of Elections said he expects to reach a turning point on the disputed 9th Congressional District election, with a vote to either certify the results or hold a new election after a Feb. 18 evidentiary hearing. In its first in-person meeting in Raleigh, the newly appointed board met in closed session for nearly four hours to learn from state investigators what will be presented at that Feb. 18 hearing. 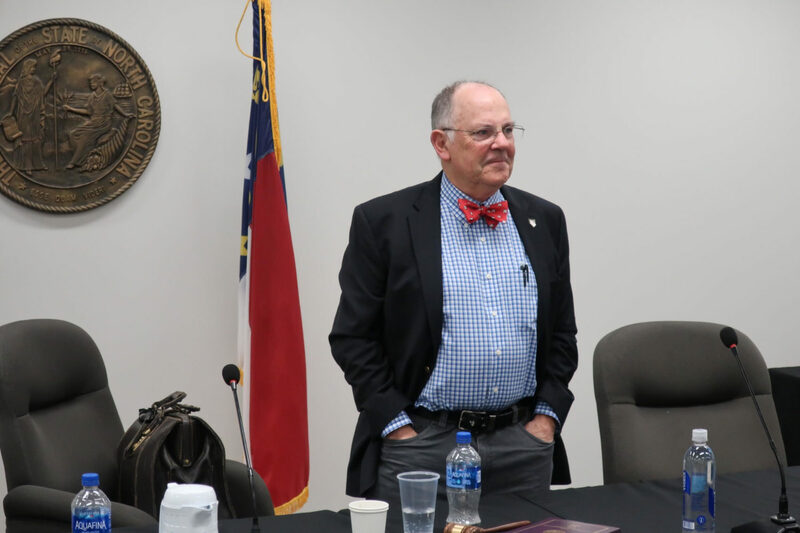 Robert Cordle, a retired Charlotte attorney who was elected chair of the new board during a conference-call meeting last week, said the public would see a similar presentation at the hearing. Afterward, he thanked the board staff for pushing ahead with the investigation while the state was without a sitting Board of Elections. The previous board was dissolved in late December as the result of a court case over the constitutionality of its appointments. A law setting up the new board didn’t take effect until Jan. 31, after which Gov. Roy Cooper appointed its five members, three Democrats and two Republicans, based on recommendations by party officials. Because Cooper is a Democrat, his party automatically gets the majority on the board. “At the end of the hearing, we will vote whether to certify the results of the election or to order a new election or any other matter that we can decide at that time,” Cordle, who previously served on the state Elections Board, said in a brief statement after the closed session. Earlier in the meeting, the chairman appeared to push back against some of the charges that have been leveled against the agency during heated, partisan exchanges following the initial refusal by the previous board to certify the elections. State GOP leaders have claimed election officials haven’t provided enough evidence to justify not declaring Republican Mark Harris the winner in the race. When the decision not to certify the race was made, based on an investigation into absentee-ballot rigging in Bladen County, Harris led Democrat Dan McReady by 905 votes. Although that total is greater than the number of absentee-by-mail ballots that were the initial focus, the investigation has since expanded to include possible destruction of hundreds of absentee ballots in Bladen and Robeson counties. The evidentiary hearing on the 9th Congressional District investigation is scheduled for 10 a.m. Feb. 18 at the N.C. State Bar, 217 E. Edenton St., Raleigh. According to a notice released late Thursday, the hearing may take multiple days, and the board has reserved the site from Feb. 18-20. In addition to Cordle, other members of the new board include Stella Anderson, a professor at Appalachian State University and former chair of the Watauga County Board of Elections; David C. Black, president of a Concord tool and die supply company and former chair of the Cabarrus County Board of Elections; Durham attorney Jeff Carmon III; and Ken Raymond a freelance writer and former chair of the Forsyth County Board of Elections. In other action Thursday, the Elections Board approved a draft set of rules on photographic identification in preparation for the implementation of voter ID legislation passed late last year by the General Assembly. This year’s municipal elections are seen as a dry run for the new ID law, which was passed by the legislature in December following approval by voters of a constitutional amendment requiring voters to provide photographic identification. Election officials say they are not certain how many voters will want to take advantage of the free ID program in each county. In 2016, before a court order ended an earlier voter ID program that had been challenged by voting rights groups, about 1,400 voters indicated they did not have appropriate identification under the law, which was far more stringent than the one adopted last year. Like its predecessor, the current law is also being challenged in court. It requires the Elections Board to establish rules on how counties will provide and maintain IDs for voters who do not have a valid driver’s license or other form of acceptable IDs. The board is also required to adopt rules and requirements that would allow voters to use student IDs from public and private colleges and universities; and employee IDs for state, federal and local governments. In unanimous votes, the board set the approval process for the rules in motion, starting with a 30-day public comment period, followed by a public hearing March 12. If adopted, the earliest the rules would take effect is April 29, two days before counties are required to start issuing IDs ahead of the municipal primaries. Colleges and universities that want to get their IDs certified by the state as acceptable for voting are operating under an even tighter deadline. They have until March 15 to submit paperwork and samples to the state as well as prove they can satisfy security requirements for ID manufacturing and distribution. Under the new law, any institution that doesn’t fulfill the requirements won’t be able to be added to the approved list until after the 2020 presidential election cycle. To speed up the approval process, the board agreed Thursday to grant Executive Director Kim Strach the authority to grant administrative approval of applications. Cordle asked that the board also be informed about any application Strach rejects.